The Takamine TC135SC features traditional Spanish design and materials as well as a number of state-of-the-art innovations. With a solid spruce top, solid rosewood back, and a soundboard bracing pattern voiced for a brilliant and rich tone, suited for todays' music. A cutaway body styles provides greater fretboard access to all 24 frets! The TC135SC is adorned with traditional marquettery rosette and gold tuners. The on-board Cool Tube tube preamp with built-in chromatic tuner is one of four unique interchangeable SoundChoice preamps which provide maximum control over any performance application. Soundchoice once again demonstrates Takamines' leadership in acoustic-electric guitar amplification technology. The CTP-1 "Cool Tube" preamp is the most significant development in "on-board" acoustic signal processing since Takamine presented the Acoustic DSP, the industry's first on-board "digital" acoustic guitar preamplifier in 1998. The Takamine CTP-1 "Cool Tube" preamp is an on-board acoustic- electric preamp that utilizes a 12AU7 dual triode vacuum tube. The "Cool Tube" preamp runs the Tube at very low voltages, therefore the tube does not glow or produce high levels of heat. The tube actually runs at only two or three degrees above ambient, so there is no concern over the delicate tone woods being affected by radiant heat. With the Takamine CTP-1 "Cool Tube" preamp, the playing will be hot, the tone will be warm, and the tube always remains cool. The tonality of the preamp is further enhanced by the use of the rotary knob labeled "Cool Tube" With this control, the player chooses the depth of effect the tube places on the signal generated by the proven Takamine "Palathetic" pickup. With this knob the player can choose from a high degree of "CUT" for aggressive strumming; expanded "sweetness" and harmonic density with fatter lows and rounder highs; or levels of rewarding richness for finger style players. An auxiliary input jack and volume knob, which can control an additional add-on pickup of your choice. 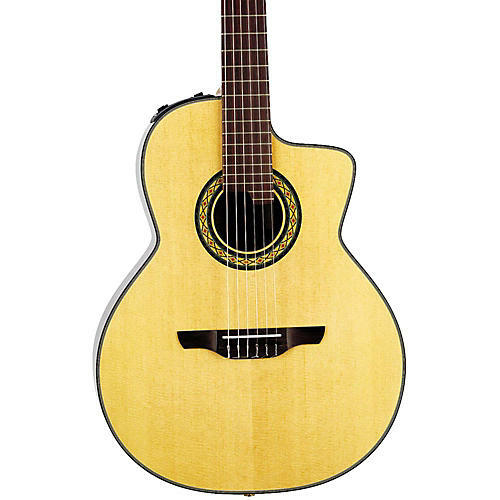 This facility can accept a magnetic sound hole pickup, or a soundboard transducer. The AUX control knob is used to blend the add-on signal with the Takamine pickup. A small switch in the back of the preamp can be used to match the varying outputs of different pickups with the preamp. The output volume slider can then control the blended signal.